RHEA is focused on the design, development, and testing of a new generation of automatic and robotic systems for both chemical and physical –mechanical and thermal– effective weed management focused on both agriculture and forestry, and covering a large variety of European products including agriculture wide row crops (processing tomato, maize, strawberry, sunflower and cotton), close row crops (winter wheat and winter barley) and forestry woody perennials (walnut trees, almond trees, olive groves and multipurpose open woodland). 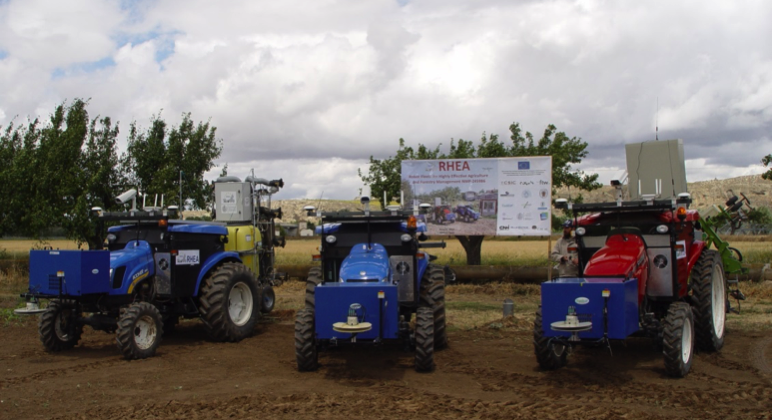 RHEA aims at diminishing the use of agricultural chemical inputs in a 75%, improving crop quality, health and safety for humans, and reducing production costs by means of sustainable crop management using a fleet of small, heterogeneous robots –ground and aerial– equipped with advanced sensors, enhanced end effectors and improved decision control algorithms. RHEA can be considered as a cooperative robotic system, falling within an emerging area of research and technology with a large number of applications as reported by the FP6 Network of Excellence EURON, Special Interest Group on Cooperative Robotics, funded by the European Commission.